If Eben wasn’t a dentist he’d be a professional surfer. But he says joining Portmore Dental in 2004, where he gets to do life-changing dentistry every day, is the best move he’s made in his life. Eben was born in Johannesburg, South Africa and qualified as a dentist in 2000 at Stellenbosch University, near Cape Town, before relocating his family to the UK. Continuing his training, Eben attended the Aesthetic Advantage Program at the University of New York, reaching Master’s Level in Aesthetic Dentistry in 2007. He was invited to the Aesthetic Alumni in Palm Beach, Florida and appointed as an instructor to Aesthetic Advantage students, attending courses at the Royal College of Surgeons and Guy’s and St Thomas’ Hospital in London. Eben acquired a Diploma in Advanced Aesthetic Restorative Dentistry from the ADAPT School of Knowledge in 2006. Eben also has a special interest in cosmetic dentistry, and emphasises the importance of listening to his patients to understand exactly what they don’t like about their smile, and what they want the end result to be. 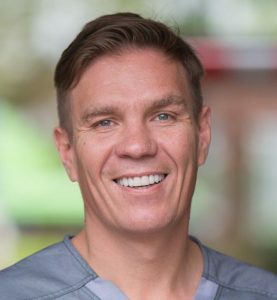 His expertise and warm, welcoming personality have earned Eben the respect and trust of the Weybridge community and referring dentists from across the South East. The answer…Swiss army knife, flashlight and a lighter!